National provider of clinical healthcare services Vocare successfully helped deliver a baby girl over the phone after receiving a call from a woman in labour in South West London. Vocare call handler, Simon Williams, who is based in the Vocare call centre 300 hundred miles away in Newcastle upon Tyne, received the call from Mrs Shafin Jahan after she went into labour with her second child. Although Mr Williams immediately scrambled an ambulance there wasn’t even eight minutes spare to wait for it to arrive. 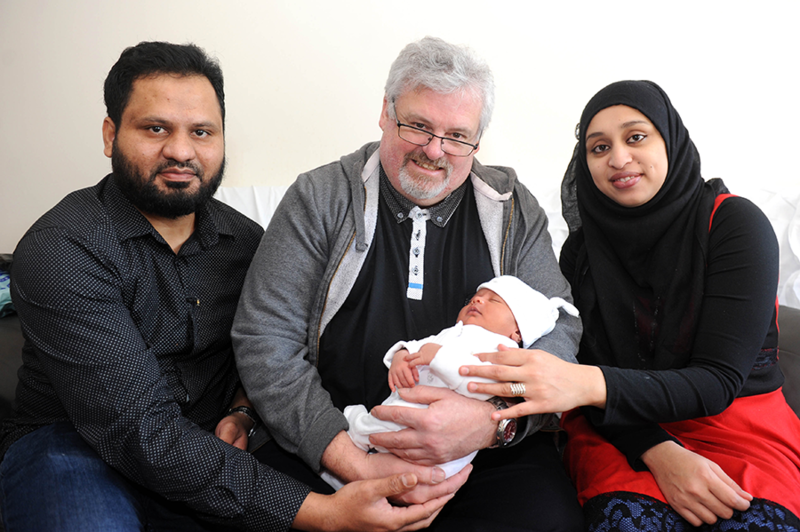 With the help of a Vocare nurse who was on hand to assist if needed, he guided Mrs Jahan and her partner Mr Hameed Siddiqui through the birth and successful delivery of their healthy baby girl over the phone. When the ambulance arrived soon after, mother and baby were already cuddled up and doing well. Following the birth, Mr Williams travelled down to the couple’s home in Mitcham, Surrey to meet the couple face-to-face and the baby girl he helped bring into the world. He said: "Mrs Jahan phoned us for help and while we requested an ambulance we quickly realised there was no time to wait. "The training and experience that Vocare has given me meant that I knew exactly what to do and felt confident advising Ms Jahan. "It is my job to help people with medical problems all day, every day, and some of them have much more complex needs but for some reason, this call felt particularly special. I felt a real sense of pride after the call. "It felt so good meeting the new family and being able to congratulate them in person." Mrs Jahan said: "Simon clearly guided us through the whole process and had a really calming influence that made me feel safe and happy the whole way through. "We are so grateful for all his help and meeting him has meant that we have been able to thank him in person. We are delighted." Vocare provides the whole range of urgent care services to over 10 million patients nationwide including operating the out-of-hours GP service in the area.